Is Yogurt a Good Post-Workout Snack? Muscles undergo stress and damage with intense workouts. Proper post-workout nutrition fosters the healing process of muscle fibers. Appropriate eating and timing of meals around workouts increases stamina and can help maximize your workout, according to MayoClinic.com. Yogurt’s nutrient content provides essential carbohydrates and proteins that the body can assimilate for muscle repair. Exercise uses carbohydrates for energy, and muscle carb depletion results from any form of exercise. Ingesting carbs after a workout refills muscle stores and refuels the body, according to Dr. John M. Berardi. Workouts also break down muscle proteins, and after workouts the body struggles with protein synthesis. Consuming protein after a workout enables the body to begin protein synthesis and repair torn muscle fibers, according to Berardi. Effective post-workout nutrition contains carbohydrates to refill glycogen stores and protein to aid with muscle repair, according to MayoClinic.com. Eating foods containing fat slows down the digestion and absorption of carbohydrates and proteins, and so fat should be avoided during post-workout meals, according to Berardi. Yogurt contains ample protein and carbohydrates and is a low-fat food, according to Colorado State University. Yogurt’s nutrient profile makes it a suitable post-workout meal. Immediately after workouts, the body seeks nutrients to begin repairing muscle damage. Consuming a post-workout meal directly after exercise enhances muscle synthesis rates, according to the University of Birmingham’s journal “Sports Medicine.” Post-workout nutrition timing is critical for recovery, and the body receives the most benefits when food is ingested immediately after physical exercise, according to the American Journal of Physiology — Endocrinology and Metabolism. Plain, skim milk yogurt contains 19 g of carbohydrates, 14 g of protein, 0 g of fat and 137 calories per 1-cup serving. Yogurt provides the necessary carbohydrates and proteins the body needs after a workout, and doesn’t contribute any dietary fat or excessive calories. Yogurt also contains essential nutrients and vitamins such as calcium, B vitamins, zinc and potassium, according to the George Mateljan Foundation’s website, The World's Healthiest Foods. 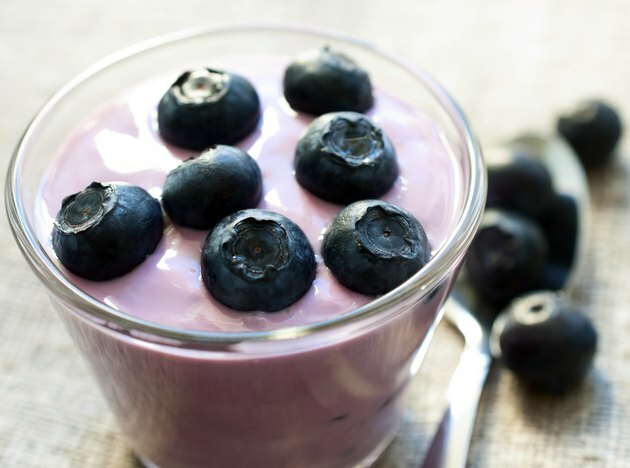 Yogurt increases fat loss and boosts post-meal fat burning, according to The World's Healthiest Foods. Not all yogurt contains healthful nutrients that suit post-workout meals. Choose a yogurt that’s low in fat and sugar, that contains active cultures and that has less than 250 calories per serving, recommends Colorado State University. Try plain yogurt or select yogurts with natural sweeteners that are devoid of artificial ingredients. Is Eating After Exercise Good or Bad?